This is the last lot of movies watched in 2015 – only three of them, in fact. Well, two movies and a season of a television series. I’m still unsure whether to continue these posts this year – what do people think? Is it worth it? I mean, I do tend to watch a broad variety of films, and while I can hardly recommend every one I’ve watched, I’ve certainly discovered directors and movies I greatly admire. I’d hope readers of this blog find these posts useful. Easy Rider*, Dennis Hopper (1969, USA). There are films you know about but never get around to watching – and it’s hard not to know about an icon of US counter-culture like Easy Rider. But I’d never seen it. Unfortunately, such knowledge often results in you thinking you know what to expect. Like two guys on choppers, driving around the US, complaining about The Man. 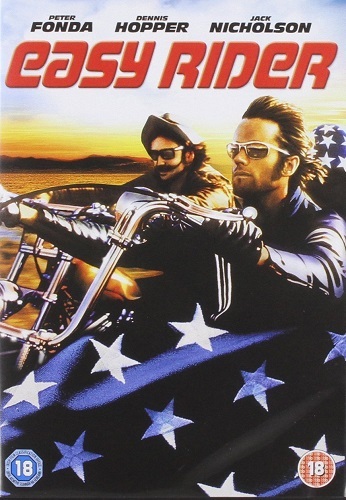 And while elements of Easy Rider might well be described as such, I actually found myself really enjoying it because it proved to be so much more. There was the music, of course – all very much of the time, but not especially obvious choices. The cinematography was surprisingly good, especially of the US landscape. The film tries for a thriller plot, but mostly fails because it’s been filmed in that less-than-rigourous manner in which actors were expected to improvise, and non-professionals were involved. Neither fact, of course, is a criticism – in fact, they can result in superior movies (except for comedies, that is, especially Seth Rogen ones). But they did somewhat upset my expectations… albeit in a good way. Despite the fact it’s likely an invention, or probably never existed, I still can’t help buying into the beardy long-haired hippy on a chopper turning their back on society thing – even though it never came to anything, and most of them ended up as either CEOs of successful hedge funds or sellers wildly improbable products that no one was interested in… I’d like to see this again; I think it bears rewatching. Shock Corridor*, Samuel Fuller (1963, USA). I know Fuller’s name from The Big Red One, which I watched last year (it’s on the 1001 Movies You Must See Before You Die list, of course; as is Shock Corridor). Although clearly done on the cheap, I thought The Big Red One a superior WWII movie, and I’m not that much of a fan of the genre. Shock Corridor, however, is an early work, a black-and-white OTT noir thriller. I wasn’t expecting much, but I ended up loving it. I plan to buy the Criterion Collection edition – and The Naked Kiss, which I’ve not seen but was made around the same time. But, Shock Corridor… A reporter poses as a patient to infiltrate a mental hospital where a patient was murdered the previous year. The crime is still unsolved, but clearly someone inside the hospital was responsible. Of course, the burden of presenting as mentally ill eventually causes the reporter to become mentally ill. But he does solve the crime. It’s all completely over-the-top – the patients are all pretty much clichés of mental patients, but Constance Towers plays a good role as the reporter’s girlfriend. In fact, she makes the film. It’s also a little weird seeing Roscoe P Coltrane play a straight role. Great stuff. 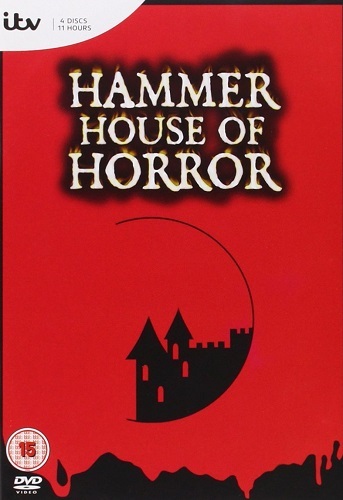 Hammer House Of Horror – Complete Collection (1980, UK). I remember these being broadcast back in 1980. I was at boarding school, and we stayed up late to watch them. I only saw a few of the thirteen episodes, however – or at least, I only have memories of a few of the episodes. Two in particular have always stood out – ‘Guardian of the Abyss’, in which a Satanic cult use Dr Dee’s original scrying glass to summon a powerful devil; and ‘The Carpathian Eagle’, which featured Suzanne Danielle as a young woman who picks up men and cuts out their hearts. Last year, the Horror channel (one of the hundred or so cable channels I have on Virgin Media which rarely show anything of interest) broadcast the entire series, but again I only managed to catch a couple of episodes. Thirty-five years later, the one thing that struck me about the episodes I watched on cable telly was that they were so very late nineteen-seventies. And they weren’t very scary at all. I’d been a little afraid they were – ‘Guardian of the Abyss’ had given me nightmares when I watched it back in 1980. So I decided to get the DVD set, and… Well, they’re not really horror, they’re more thrillers, often with only a hint of the supernatural. They were also a lot better than I’d expected. Production values were pretty high for the time (okay, so the same manor house appeared under different names in multiple episodes, but never mind), the cast were pretty high-powered – Denholm Elliott, Peter Cushing, Brian Cox, Jon Finch, Simon MacCorkindale, Paul Darrow, Diana Dors, Warren Clarke, Dinah Sheridan… – and the final twists weren’t always blindingly obvious. Perhaps one or two episodes felt a bit stretched for their 51 minutes running time, but others were very effective in the scares department. When the DVD set arrived, I wondered why I’d bother ordering it, but having now seen all thirteen episodes I’m glad I did. ‘Guardian of the Abyss’ is still hugely creepy, if no longer nightmare-inducing; the plot of ‘The Carpathian Eagle’ is far more obvious than I’d remembered but is still good drama; and there are also fun episodes like ‘The House that Bled to Death’ (Carrie, in a semi-detached),’ A Rude Awakening’ (Denholm Elliott trapped in a sequence of nested nightmares), ‘Visitor from the Grave’ (woman kills an attacker, but he continues to haunt her), and ‘The Two Faces of Evil’ (scary hitchhiker proves to be a doppelgänger of a woman’s husband). Good stuff. Categories: film review, films, moving pictures 2015 | Tags: dennis hopper, hammer house of horror, samuel fuller | Permalink.